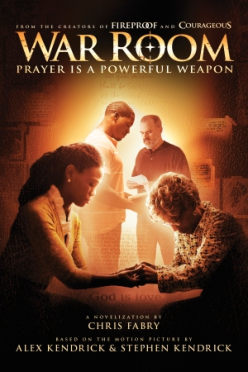 Another offering from the creators of Fireproof, Courageous and Facing the Giants is War Room. Miss Clara (Karen Abercrombie) an elderly widow who is in the process of selling her house calls on the services of real estate agent Elizabeth Jordan (Priscilla Shirer) to help her find a buyer. What Elizabeth thought was going to be a normal business sale turns out to be a lesson in combat. Miss Clara teaches Elizabeth, who is going through some trying times in her marriage and family, how to fight effectively in prayer. Abercrombie shines in her character of the sharp quick witted Miss Clara. Widowed young she recalls how she was once like Elizabeth, fighting with her husband, and how she had to learn to fight the real enemy who waged war on her marriage and family. Elizabeth’s husband Tony Jordan played by T C Stalling, a top salesman in his company, goes through the reality experienced by most men trying to provide for their family. He feels the pressure to advance in his career to secure more money to finance their lifestyle. Facing temptation from every side Tony finds himself at the crossroads in his faith walk. Will he give it all up and do what is right or will he give in to the desires of the flesh? Danielle Jordan (Alena Pitts), their daughter completes this family. The young Alena Pitts gives a memorable performance as the hurt daughter who has to live in a house where the parents are constantly fighting. She is convincing in her portrayal of Danielle in her varying emotional lows and highs. This movie is a must watch for the whole family. Whether single or married, viewers will be spurred on to pray. They will be encouraged to come up with a battle strategy for their lives and the people they love. There is a battle raging and it calls on all of us to War!!!!! War Room has had a successful run in the United States where it opened in August. It was at number one across all film genres. It opens in South Africa tomorrow, November 6, 2015. Have seen the trailer of this movie on Daystar TV and been so looking forward to it. Was great to hear Priscilla Shirer speaking of how relevant the movie is for today with regard to prayer and the need to do battle against the enemy of our souls!! Awesome Val! I was also looking forward to watching it and I was not disappointed.God bless you.. I watch this movie at every chance I get. The world needs this combat prayer strategy. For we are not fighting flesh and blood but something sneaky and hidden. Wish all married couples see it. Yes Maki. That is so true! We need to be prayerful and need a strategy..